There was a short road ahead for Chrysler's premium luxury Imperial. Always trailing behind competitors Cadillac and Lincoln, the Imperial seemed stuck forever in a distant third place. Brief glimmers of hope popped up over the years, when sales seemed to show a bit of strength, but it never seemed to stick for some reason. The all-new 1974 Imperial was a beautiful car. Classy and elegant as it passed by, onlookers looked at the car with respect and admiring glances. For some reason, that admiration didn't spill over into the sales department at your friendly neighborhood Chrysler dealer. 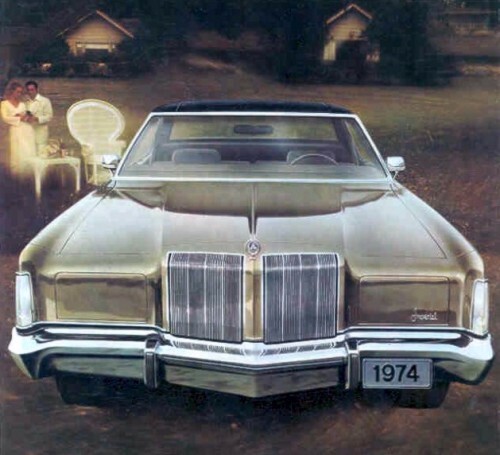 The 1974 Imperial generated sales that resulted in only 14,426 being built. Truly a disappointing number, and not enough to warrant continued attention to the model. Even though sales started off and remained slow, Chrysler still introduced a Crown Coupe model mid-year, on March 25, 1974. The Crown Coupe package was sales code V4Y, and was a $526.70 option. This package included a padded vinyl roof over the forward section of the roof, with a painted rear section. The rear quarter windows were stationary, and the padded vinyl roof surrounded them, giving them an opera window appearance, which was a very popular styling touch on other luxury cars of the time. The rear seat switch panels were modified to remove the power window switch, leaving only a reading lamp on/off control. The Crown Coupe was available in only one color, Golden Fawn, and came with a Gold vinyl roof and either Gold Ribbed Velour or Gold Leather upholstery. Some report 5 cars were built with White Leather upholstery with Gold carpeting, instrument panel, and shelf panel. All totaled, only 57 Crown Coupes were built, making them very rare today. The modification was done by American Sunroof Corporation's Specialty Car Division. Imperial LeBaron 2-Door coupes destined for this option left the factory with no vinyl roof, which was unusual since the vinyl roof was considered a standard item. Imperial's competition for 1974—Cadillac and Lincoln—were both heavily restyled for the year, with new front and rear appearances, and Cadillac featured new rear quarter panels as well. Inside, Cadillac received a new instrument panel which was attractive but could have been laid out better as some of the controls were crowded and difficult to operate. This should have been good news for Imperial, as historically it sold better when it offered new styling in a year when its competition didn't. It would seem 1974 could have been the year for a big come back, but it was not to be. Shortly after the 1974 models were introduced, a war in the Middle East resulted in an oil crisis here at home. Gas prices shot up, and before long gas stations began running out of gas. Sales of full-sized cars came crashing down, and that included the luxury models. Chrysler couldn't have introduced the new Imperial at a worse time. As far as quality control, driving capabilities, luxury, ride, and dependability go, the 1974 Imperial was the finest one ever built. Period. Some sacrifices had been made over the years to accommodate safety or cost requirements, but they just don't come any better than the 1974-1975 Imperial. Chrysler encourage people to compare before the chose their next car. If people had taken that advice, we're willing to bet that there'd have been a lot more 1974 Imperials sold!